Jewellery from MyBonBons by Nomination is dedicated to anyone who uses their accessories to say something about themselves. 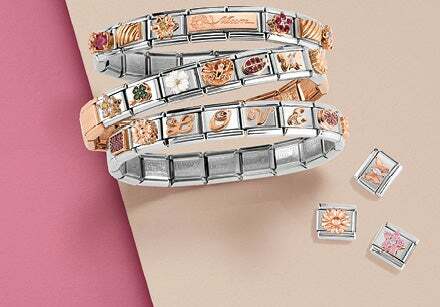 High fashion and high quality, jewellery from the MyBonBons line is crafted in stainless steel and decorated with precious symbols in gold and disks adorned with Cubic Zirconia. Choose a ring with a personalised symbol if your goal is to surprise someone special with a one-of-a-kind gift! The offering includes rings with letters, good luck charms, zodiac signs and all sorts of iconic and trendy symbols. Choose a ring with your initial if you want to express yourself with the jewellery you wear. Give someone you care about a ring with their zodiac sign in celebration of a special occasion. Opt for a good luck symbol if you’re looking for a ring to cheer up someone you love. All Nomination jewellery is guaranteed by Made in Italy quality.